Ask Clark Winter about the booming real estate market in the U.S., and the chief global investment strategist of Citigroup’s Global Wealth Management division puts it this way: “People invest out of greed and fear — and U.S. real estate works in both columns.” First, greed: Investors across the world are flocking to the U.S. real estate market, lured by rising prices and stories of sudden real estate fortunes. Historically low interest rates and a weak dollar relative to other currencies have created what Winter calls “a wall of money” that is pushing up property values. This in turn has led to a great deal of “blind money” from numerous sources into funds that buy office buildings, shopping malls, multifamily apartment complexes and the like. But many of those same investors are also acting out of fear, disillusioned by the recent poor performance of stocks and bonds, and wary of an uncertain economic outlook. That may be as good a take as any on U.S. real estate’s recent star turn, but a key factor in the mix has been changing — that is, of course, interest rates. The benchmark federal-funds rate has risen steadily since June 2004; nevertheless, long-term real estate mortgage rates have remained at attractively low levels. But mortgage rates likely won’t stay resilient to rising short-term rates forever, and if mortgage rates do rise, commercial borrowers who haven’t locked themselves into low, long-term rates will face higher debt-service bills. Unless they are able to negotiate higher rents, the value of their properties will fall. Perhaps more so now than in the recent past, the fate of the U.S. real estate market hinges on the behavior of interest rates. And while predicting the movement of interest rates is a notoriously difficult endeavor, investors in real estate would do well to understand the market forces at work in the sector, according to experts at The Citigroup Private Bank, a provider of wealth-management services for high net worth clients, and faculty at Wharton. Moreover, recent research from Wharton illustrates how an overheated real estate market, coupled with rising rates, can have a dire impact on a country’s banking system and economy at large. Even so, commercial real estate investors would do well to be wary of higher interest rates. That’s because if interest rates do rise, they would carry a potential “double whammy,” according to Damian Kozlowski, CEO of The Citigroup Private Bank. First, higher interest rates would make the U.S. dollar stronger, choking off the flow of funds from foreign investors into U.S. real estate. Second, U.S.-based investors would obviously find it more difficult with costlier debt. “A strengthening dollar and more-expensive local real estate markets could lead to a significant correction in real estate prices,” Kozlowski says. Rosenberg says many real estate investors think that they are hedged against a rising interest-rate environment — a notion that’s only partially true at best. Real estate acts as an inflation hedge, given fixed-rate mortgages and the ability to pass many operating expenses along to tenants. “But one must remember that as interest rates increase, economic activity often weakens. That makes it harder to push rents higher and find new tenants to replace old ones,” he says. Such a turn in the market could have important effects far beyond the real estate market, according to a recent research paper by Susan Wachter, Wharton professor of real estate and finance, and Andrey Pavlov, professor of finance at Simon Fraser University in Burnaby, British Columbia. In their spring 2005 paper titled, “Real Estate Crashes and Bank Lending,” published in the Wharton Real Estate Review, they say bankers chasing market share and compensation bonuses tend to underprice risk in a systemic fashion with potentially disastrous consequences. Wachter and Pavlov say that scenario could create crises beyond the banking system or the real estate industry. They contend that as such systemic underpricing narrows the spreads between lending and deposit rates, it also has the effect of pushing asset prices above fundamental levels, both of which erode lenders’ long-term profits. “The increase in asset prices is the most troubling,” they say, “because of the implications for macroeconomic stability.” They add that inflated real estate prices induce a construction boom and an inefficient allocation of resources within the economy. Stephen Coyle, chief investment strategist at Citigroup Property Investors, is particularly bullish on the U.S. office, industrial and hotel sectors over the next three years. “Right now, we are at a national vacancy rate of 13.6% in the office markets,” he says. “That’s about the point where rents start to rise.” Coyle adds he has “a hard time getting excited” by opportunities in the multifamily housing market, which historically has been the least volatile market and therefore draws investors in hordes. He says that one plus for the sector is that if interest rates rise, homeownership levels will fall, resulting in increased occupancy levels for multifamily properties. “But they don’t get pricing power,” he warns. He says capitalization rates — the relationship between the income stream from a property and its present value — for multifamily properties are very aggressive, currently 4.9% on average, according to the property index compiled by the National Council of Real Estate Investment Fiduciaries. This is the second part of a three-part report; read parts one and three, or download a pdf version of the entire report. Cut to the present, and there is evidence all around that the current real estate boom has gripped investors from Sao Paulo to Shanghai. Clark Winter, chief global investment strategist at Citigroup Global Wealth Management, says it’s getting easier to secure legally enforceable titles to property in many countries in Latin America, Eastern Europe and Asia — something that didn’t exist in earlier years. That has coincided with easier access to credit and equity flows fueled by robust economic growth. Winter recalls how London was one of the first recipients of global investors’ real estate capital after it opened up in the post-Thatcher years. To identify similar opportunities, experts from Wharton and Citigroup note, investors need to develop a real, local understanding. In the fall 2004 edition of the Wharton Real Estate Review, Jacques Gordon, global strategist at Chicago-based LaSalle Investment Management, cautioned against using the word “global” too broadly for real estate. “There is little that is ‘global’ about the world of international real estate,” he says. “This is not a world that treats all 197 countries tracked by economists at the United Nations, the World Bank, the OECD and the IMF as equally eligible investment targets.” Gordon says the capital willing to flow into real estate comes mostly from eight to 10 countries and is headed for no more than 20 or 25 countries. Research by LaSalle Investment Management’s parent, Jones Lang LaSalle, identified the principal origin countries for real estate capital in 2002 to 2004 as Australia, Canada, Germany, countries in the Middle East (including Israel and oil-exporting Arab states), the Netherlands, Singapore, the U.K. and the U.S. The target countries, however, represented 80% of the world’s gross domestic product. What are the obstacles? First, the trend toward legally enforceable titles has only just begun. Indeed, lack of transparency and the inability to secure property rights still get in the way of real estate capital going to many emerging markets, Gordon says. Also, many local real estate practices show relatively few signs of “convergence” despite the pressures of globalization. “Lease contracts, mortgage instruments, and regulatory and tax regimes remain deeply rooted in country-specific traditions, notwithstanding the growing trend of cross-border investing and the advent of multi-country trade blocs,” he says. Gordon acknowledges that transparency regarding the nature of these differences is rising, but country-specific real estate practices remain closely tied to long-held institutional frameworks. Gordon lists some of these: the Civil Law versus Common Law approach to property rights; tenant-friendly versus landlord-friendly approaches to lease contracts; and local standards applied to building and zoning regulations. Stephen Coyle, chief investment strategist at Citigroup Property Investors, sees some “sweet spots” amid all this uncertainty. For instance, he finds the western German residential market to be “interesting” and says Citigroup is active there. “Properties are being sold for 80 cents on the dollar at today’s values, which is up from 70 cents on the dollar six months to a year ago and 50 cents on the dollar three years ago,” he says. “The problem is, if you buy a portfolio, you are going to have some eastern German exposure, and you want to limit that.” He also sees openings where others see problems: “The lack of transparency in Europe creates a lot of opportunity, especially as corporations and governments sell off non-strategic real estate as part of the ‘Great Exchange’ from users to investors.” And he warns investors to stay away from markets that lack a clear financial infrastructure. Coyle says his team is spending a lot of time scouting for opportunities in China, India and Japan. He’s upbeat on Japan, especially with the recent recovery in its economy. He also expects “a ton of assets” heading for sale after February 2006, when a new law will take effect requiring corporations to price their assets at fair market value. “You are going to see more and more assets brought to market on behalf of corporations, not just government-owned stuff,” he says. Earlier this year, India enacted laws that make it easier for foreigners to invest in construction and real estate, and the country has worked on streamlining master planning and zoning. “We’re particularly excited about the Indian market, especially with the recent policy changes and the general growth we expect to see happening there in the office and retail space,” says Todd Thomson, chairman and CEO of Citigroup Global Wealth Management. Other markets on his radar include the Ukraine, where he expects a turnaround, as well as Poland and Hungary. Another China bull is Quek Kwang Meng, who heads real estate investment for the Asia-Pacific region at The Citigroup Private Bank for clients in Hong Kong, China, Singapore, Thailand, Malaysia, the Philippines, India and the Middle East. “Asian investors are wary of interest rates, but the dynamics are different in this region because of the huge growth in demand, and there is a shortage of supply,” he says. He points to Shanghai, for example, a city of about 18 million people where the annual supply of 200,000 housing units is equivalent to the whole of Australia. China’s rapid growth is fueling a large migration to cities from rural and suburban areas. Wages in China are rising 15% to 20% annually, and people need housing. Quek says real estate developers in China are raking in returns of more than 20% on their investments, and Hong Kong’s property prices are up 120% from 2003. He now feels emboldened to launch a few real estate funds. Several large developers have floated their own funds in an attempt to distribute risks and enhance their ability to take on large projects. Quek isn’t worried about the market risks should interest rates rise, mainly because of the Chinese government’s clampdown on speculative activity. Banks avoid giving loans to people buying their third or fourth house, which also has cooled the market for luxury homes. Elsewhere in Asia, Quek says loan-to-value (LTV) ratios are conservative at 60% to 70%, and governments and banks discourage excessive borrowing. Hong Kong doesn’t tolerate LTVs beyond 70%, and Singapore’s 90% threshold also keeps debts in check. In addition, Hong Kong and Singapore have no capital-gains taxes, something Quek sees as a big plus for his investors. The real estate investing market is also strong in Brazil, where Jan Karsten is the Latin America head of Investment Counseling for The Citigroup Private Bank. His high net worth clients hold an average of 50% of their portfolio in real estate. Brazilians hold a high portion of their investments in real estate chiefly because it has been viewed as the surest way to protect their net worth against inflation. Karsten says that despite high exposures to real estate, Brazilian investors hold the rest of their investments in liquid, fixed income instruments, besides private equity and hedge funds. A significant portion of Brazilian investments traditionally has been in Argentina, and that continues with Argentina’s robust economy. Karsten says attractive exchange rates also entice U.S. and European investors, especially in agribusinesses and wineries. Karsten is not worried about interest rates; they are now around 17.25% in Brazil, and “there isn’t much room for them to go any higher.” Also, 2006 is an election year and Karsten expects interest rates will be lowered given the political mileage such a move would offer. Real estate is gaining an increasingly larger share of high net worth portfolios in Mexico and elsewhere in Central America, according to Eduardo Dosal, global market manager for The Citigroup Private Bank in Mexico. He says credit is more easily available for real estate owners than it was four years ago, and interest rates have been steadily lowered (about 10% currently compared with the punitive 80% a decade ago). Also, the political and economic stability of the region is improving, which has contributed to investor returns of 20% or more in real estate. A rise in U.S. interest rates would affect Dosal’s markets significantly, especially the dollar-denominated bonds issued by many Latin American governments. He says his investors “have already started asking a lot of questions about private equity deals, and are investing in them.” Much of this investment is destined for the U.S.; he says most local Latin American markets don’t offer the liquidity or depth in stocks and bonds, let alone options in leveraged buyouts or hedge funds. Against this backdrop of beckoning offshore markets and changing fundamentals at home, Citigroup executives expect many of their high net worth clients to gravitate toward opportunistic plays in search of higher returns. The Citigroup Private Bank CEO Damian Kozlowski says that as large capital inflows have lifted U.S. property values to uncomfortably high levels, “investors are going down the food chain” to look for other situations they may not have necessarily considered in the past. But with such investing where they don’t understand the terrain so well, Kozlowski finds them “less confident that they can make it work like they did the last time.” Clearly, while they are searching for the next pocket of opportunity, they are treading cautiously. This is the third part of a three-part report; read parts one and two, or download a pdf version of the entire report. Given the prospect of rising interest rates in the U.S. and elsewhere, and the challenges of finding opportunities overseas, many real estate entrepreneurs are looking for ways to protect their portfolios. “Real estate has attracted significant investment, leading to high valuations, and some clients are expressing concerns about the potential for declining values in a rising interest-rate environment,” says Marc DiLorenzo, chief operating officer at The Citigroup Private Bank. Indeed, as the threat of rising interest rates to U.S. real estate becomes increasingly real, investors should consider ways to lower their risk exposure, according to experts at Wharton and The Citigroup Private Bank. The Citigroup Private Bank’s typical high net worth client has a net worth of at least $25 million, and many have made their fortunes in real estate, according to CEO Damian Kozlowski. They are typically entrepreneurs, real estate developers and financial sponsors like private equity firms. The Citigroup Private Bank’s clients tend to concentrate their investments in a single asset class. “We build our business around that investment behavior,” he says. What’s in a typical real estate client’s portfolio? Three things, according to Kozlowski: concentration (relatively few asset types make up a large proportion of net worth); correlation (those holdings tend to behave similarly); and illiquidity (investments are locked up for many years). “Even when they get out of whatever their primary holding is, they reinvest in assets that behave similarly,” Kozlowski says. For example, when entrepreneurs sell their companies, they might reinvest their proceeds in the stocks of the companies they sold to. Also, portfolios’ illiquidity makes them too inflexible to allow for quick responses to macroeconomic shifts. Put it all together, and structuring portfolios that have inherently counter-balancing characteristics as responses to so-called “event risks,” like interest-rate increases, becomes critical. Rosenberg also says investors should pick good managers who provide diversified portfolio offerings, even if the investor is intimately familiar with real estate. “If you are a small investor — and that includes people with a net worth of $25 million — and you want to put, say, 10% or 15% in real estate, you still don’t have enough capital to self-select your own portfolio,” he says. That’s why real estate entrepreneurs should turn to experienced real estate fund managers and adopt an asset-allocation strategy that accounts for real estate’s unique characteristics. However, building such an efficient portfolio presupposes an ability to compare risks and returns across different asset groups. The historical data most widely used in the real estate industry are compiled by the National Council of Real Estate Investment Fiduciaries (NCREIF), a not-for-profit industry association in Chicago. Its members include real estate investment managers, institutional investors, accountants, consultants, appraisers and academicians. At the end of 2004, the index compiled by NCREIF covered 4,152 properties with a market value of $145.44 billion. In a 2004 paper titled, “Real Estate Returns in Public and Private Markets,” Wharton professor of real estate and finance Joseph Gyourko points to some limitations in the NCREIF index, especially when it displays an “extremely low volatility” in returns. He notes that the information from the NCREIF series is not transaction-based and “as such, does not represent the true performance of arm’s-length trading of properties.” In his paper, Gyourko demonstrates that the very low volatility of real estate returns as measured by the NCREIF index reflects measurement error. Gyourko points to the pitfalls of relying too much on the NCREIF index in the design of investment portfolios, noting that the low volatility of returns leads to “artificially favorable portfolio implications, as the covariance of this real estate series with stocks and bonds is artificially low.” In a standard asset-allocation model, he adds, that would have the effect of assigning a significant portfolio share for appraisal-based real estate. 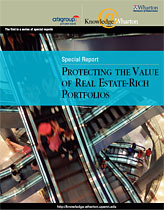 But in practice, that is not the way investment managers typically have viewed real estate’s place in portfolios. He says that with commercial real estate’s share of the investable universe estimated at about 10%, “one does not have to be a committed believer in efficient markets” to conclude that a significantly higher allocation to real estate is too high. Citigroup has addressed similar concerns over the last several years through its own research, as part of its Whole Net WorthSM asset-allocation methodology. According to Nicolas Richard, head of Strategic Asset Allocation at Citigroup Global Wealth Management, Citigroup has employed a variety of methods to correct several significant shortcomings in the historical data of the returns, risks and correlations of different asset classes. He names some of the technical challenges addressed by Whole Net Worth regarding alternative assets such as real estate: using artificial appraisal valuations for illiquid assets; making the most of short track records; survivorship bias (when investments that have failed to survive during a period under study are excluded from the data examined, skewing the results); and selection bias (when incorrect sampling excludes relevant groups of securities or entities, which again creates misleading results). Richard and his team try to get around “staleness” in the underlying components of indexed returns. Staleness occurs in the case of real estate, private equity, distressed debt or other illiquid assets, which do not allow fund managers to provide accurate monthly returns to index providers. The resulting infrequency of valuations creates artificially low volatility in returns. Another imponderable is the so-called “fat tail” risk, where an asset class may not be volatile but still presents significant downside event risk. According to Richard, this could happen “when in one month out of 20 you get really, really bad returns.” Only by incorporating all of these characteristics of real estate can you build efficient portfolios and truly understand their risks, he says. Citigroup’s Rosenberg, however, thinks it is critical for high net worth investors to be better prepared for interest-rate shocks. The main plank of his strategy is to design portfolios with assets that have opposite return distributions over a period of time. “According to our research work, what you need are other asset classes that offer investors the ability to buy into a positively skewed distribution,” he says. In essence, this means steering clear of negative returns. He says such assets tend to have “equity-like characteristics,” examples of which are directional hedge funds and leveraged buyouts. Rosenberg explains that unlike hedge funds that try to cut out all the beta risks, directional hedge funds retain some exposure to the equities market. “Their equity characteristics and their positive exposure to the market give directional hedge funds and LBOs varying degrees of equity exposure, so that gives you a positive skew in the portfolio,” he adds. Rosenberg says these asset groups carry event risks, but historical-return distribution curves show they are positively skewed. While real estate investments could face a negative event risk at some point over a cycle, he says, LBOs could have a positive event risk at some other juncture; over time, the two could cancel out each other. Investors could also dip into a range of derivative products that allows them to trade returns for liquidity and stabilized debt-service obligations. Rosenberg goes about designing investment portfolios with a keen eye on liquidity. Many high net worth clients come to him with sizable pre-existing real estate or other holdings that may be relatively illiquid, so the challenge is to balance those with instruments that have more liquidity. Of course, a lot depends on the investor’s degree of willingness to tolerate illiquidity and other objectives, including safety and growth in value. “Based on the success of many of our real estate entrepreneurs, we do not try to tell our investors what to do,” Rosenberg says. “These individuals are among the more independent type of investor out there.” Even so, he persuades them to take the excess cash flows from their properties and invest them in assets that diversify their risks. Ajay Badlani, head of the U.S. Analytical Lab for The Citigroup Private Bank, says one way to mitigate the event risks that real estate investments carry is to include assets in your portfolio, such as equities, that have a low correlation to real estate. The potential downside risk of the portfolio can be diminished further by buying protection, such as put options on equities. “What’s clear is that the more tools investors have at their disposal, the better they can position real estate-rich portfolios,” Badlani says.